Five years ago, Dominion founded the genre we now know as deck-building games, games you start with a fixed deck of cards that you then expand by adding new cards to it whenever you can afford them. Since then, pretty much every major publisher has created one or five of these games, and at this point pure deck-building as a genre is beyond it’s zenith. However, the same is not necessarily true for deck-building as a mechanic. As one part of a wider game, there are still many places to go with deck-building, and with Trains Hisashi Hayashi goes there. Both building stations (more precisely, Station Expansions) and laying rails are standard action card that are available in every game, and every player starts with some of them. Station Expansion is the easier of the two: you play the card and place a Station Expansion on a city hex on the map. 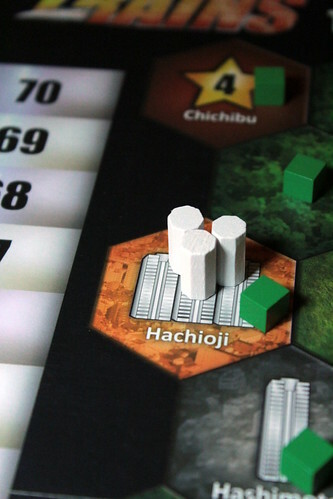 The only thing to consider is the number of allowed expansions in a city, but it’s hard to overlook the one to three towers printed on city hexes. Station Expansions are big scorers: a city with three expansions is worth eight points for everyone who’s rails go there. Furthermore, Station Expansions are neutral, so you score points for things your opponents built. Neat, right? Laying Rails is very slightly more complex because you have to pay for them with Train Cards, meaning money. How much you pay depends on the terrain with plains being free, river costing one and mountains costing two money. The price to lay rails into cities depends on the number of Station Expansions already there – it gets more expensive, so you want to arrive early. Around the edge of the board you find another type of hex called a Remote Location that represents a distant location to connect by an intercity train. Those remote locations have the price printed on, up to five money, but they score the same number in points, so they are worth connecting. To all those prices you still have to add one money for each opponents’ tracks that are already on the same hex – obviously, building on a wide, empty field is cheaper than crossing a bunch of other tracks. That’s actually the thing that sets Trains apart from PODBs (plain old deck-builders) in my eyes: you interact on the board. Sure, many deck-building games included cards that interacted with other players – mostly forcing them to discard – but that was always sort of random. You never knew when it would happen, it was annoying as hell, and mostly it didn’t benefit the attacker beyond damaging you. Laying rails on the board is different, you see everyone’s plans developing, you can guess where the others want to go. You can make a decision to avoid the other players and connect cheaper but less valuable locations or spend more money to get into the thick of it. You can’t really lock someone out of a profitable location, but you can make it more difficult for them to get there by laying rails across their path and force them to pay extra. 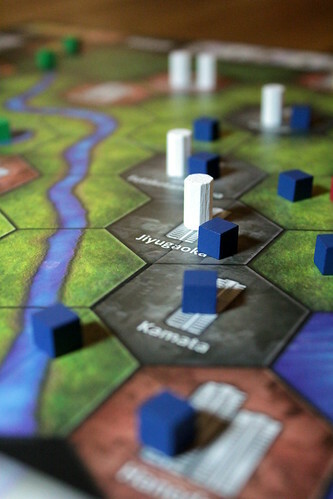 The interaction on the board works very well for me and my only complaint is that the maps – the board is double-sided, showing a different region of Japan on each side – are slightly too big. Especially when playing with less than four, it’s easy to avoid the other players, slightly more tight quarters would have made for a more tense game. 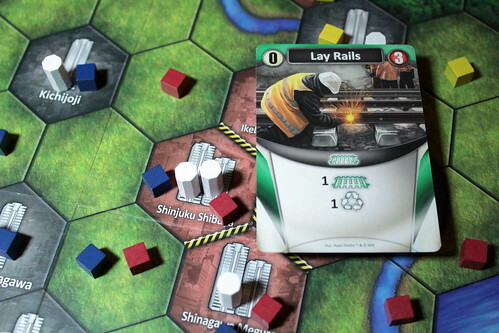 But laying rails isn’t everything, I did say that Trains is a deck-building game, so your deck you shall build. Instead of spending your money on laying rails, you can also invest it into new cards. Of course you can always buy more of the standard cards – Points, Money, Lay Rails and Station Expansion – but the more interesting ones are the eight special cards randomly determined at the start of the game, and the available cards have a big impact on your strategy, like in other deck-builders. There might be special trains there, like the Tourist Train that is not only worth money but also earns a victory point every time it runs. Or my personal favourite, the Freight Trains that transports Waste cards out of your hands. Waste cards are the nasty side effect of building: when you Lay Rails or build a Station Expansion, you take a Waste card that does absolutely nothing except show up in your hand instead of something useful. The Freight Train is one way to rid yourself of those. Other cards act as a Lay Rails card with reduced costs, like the Steel Bridge that negates the extra cost for building on a river hex, or Collaboration that lets you ignore other players’ tracks when calculating the cost. But most of the cards are action cards that can do pretty much anything. Passing Station and Signaling Area let you draw one or two cards, respectively. So far that’s easy. The Signal lets you draw a card and then decide if you leave or discard the top card of your deck. The Wagon Factory upgrades a train to a more expensive train, your Ironworks make money every time Lay Rails. And so on, there are 30 different cards that may show up, and while at one point in my life I could calculate the number of possible sets of eight out of 30, that time is long over. But there are many options, and they all make for a different game. One small thing I’m missing in card options is some better deck management. It’s easy enough to rid yourself of waste cards, but other cards are harder to get out of your deck. Especially Normal Trains I’d like to decommission around the middle of the game, but that’s rarely possible. Minor nit-picking aside, though, Trains is a lot of fun to play. It has all the fun parts of a good deck-building game: easy rules, very variable setup, and easily expandable. I’d be very surprised if there wasn’t an expansion next year. At the same time, it does some things better than pure deck-building games, especially when it comes to interaction. Trains is still not a very interactive game, but you do interact on the board and that interaction feels more meaningful and less random than the typical “discard two” cards you get in other games. I was very happy with Trains and how it incorporates deck-building as a mechanic into a wider game. It certainly won’t be the last game to do that.